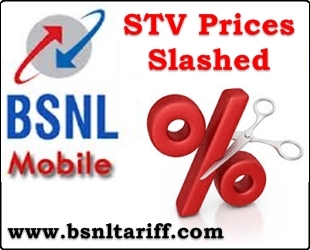 Telecom-Backbone Public Sector Unit Bharat Sanchar Nigam Limited (BSNL) has Slashed Price for Data Special Tariff Vouchers (STVs) and Revised Data Tariff under both GSM 2G and 3G Prepaid Mobile Services on occasion of Independence Day across Punjab Telecom Circle. Special Tariff Voucher of Rs.14/- offers, Free 100MB Bundled Data usage with validity for 3 days and Rs.0.02/10KB charges after Free Data Usage. Special Tariff Voucher of Rs.40/- offers, Free 240MB Bundled Data usage with validity for 7 days and Rs.0.02/10KB charges after Free Data Usage. Special Tariff Voucher of Rs.78/- offers, Free 500MB Bundled Data usage with validity for 15 days and Rs.0.02/10KB charges after Free Data Usage. Special Tariff Voucher of Rs.98/- offers, Free 700MB Bundled Data usage with validity for 21 days and Rs.0.02/10KB charges after Free Data Usage. Special Tariff Voucher of Rs.139/- offers, Free 1GB Bundled Data usage with validity for 30 days and Rs.0.02/10KB charges after Free Data Usage. Special Tariff Voucher of Rs.251/- offers, Free 2GB Bundled Data usage with validity for 30 days and Rs.0.02/10KB charges after Free Data Usage. Special Tariff Voucher of Rs.561/- offers, Free 5GB Bundled Data usage with validity for 30 days and Rs.0.02/10KB charges after Free Data Usage. Special Tariff Voucher of Rs.1011/- offers, Free 10GB Bundled Data usage with validity for 30 days and Rs.0.02/10KB charges after Free Data Usage. All existing 3G and 2G Data STVs and packs for pre-paid GSM services will be withdrawn with effect from 15.08.2013. The data usage charges for “bsnlstream” will remain the same at Rs.0.25/MB. For Prepaid 2G Data customers, who have recharged 2G Data STVs till 14.08.2013. The customer profile is to be converted to default profile of 3G with no speed restriction from 15.08.2013. The customer profile in the new unified Data STVs will be 3G with no speed restriction. Special Independence Day offer for denominations of Rs.14/-, Rs.40/-, Rs.78/- and Rs.98/- Special Tariff Vouchers (STVs) with effect from 15-08-2013 to 12-11-2013.